HAWSON Jewelry: Your Best Choice for Tie Clips and Cuff Links. 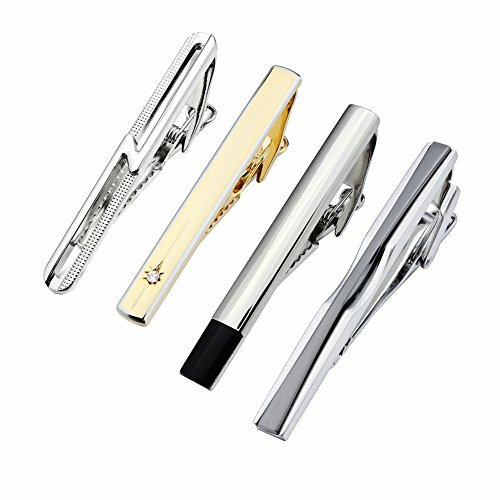 HAWSON Personalize Design 4PCS Tie Bar Clips Set for Man Gift Jewelry Silver Gold. Rhodium and Gold Plated Base Copper Fashion Man Tie Bar Clips. 4Pcs Men Tie Clip Bar Set Vary in Size:0.25in. (W), 2-2.3in. (L),Weight:37g,Packing with A Velet Gift Bag. Wear It Right:Clips Should be Worn Two-thirds Down the Necktie Between the 3rd or 4th Button.